Bite-sized banner stands perfect for adding flare to your table or display space! Smaller banners for a bigger impact! Looking for a smaller display to compliment your trade show exhibit? 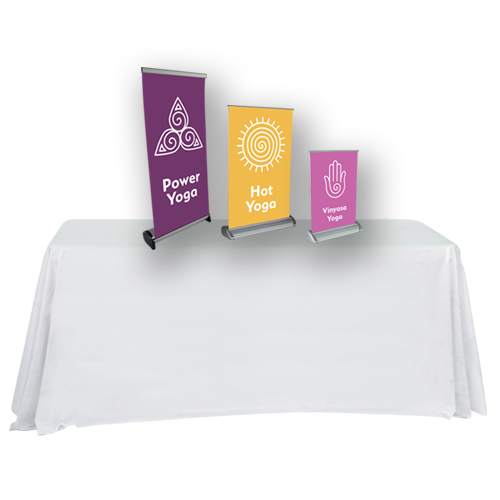 Create your own custom Tabletop Retractable Banner Stand with Hotcards to maximize your advertising space! Perfect for presenting for detailed information like calendars or graphs, these banners are designed to help add the final touch, function and flare to any design space. This is one of our most popular products in the category! A true fan favorite. Make a bold impact when you have it on display – then simply tuck away with this retractable display. Banners The best banners do one job: clearly share your announcement. X-Frame Banners The versatility of our X-Frame Banners can’t be matched! Retractable Banner Stands Drive sales and promote your company with our Retractable Banner Stands! Double Sided Retractable Banner Stands Double-sided, for double the advertising!